This idea is so slick — you may never look at a smoothie again for its antioxidant content. This is easier, cheaper (especially if you have a garden), and lower in calories (if you count them). 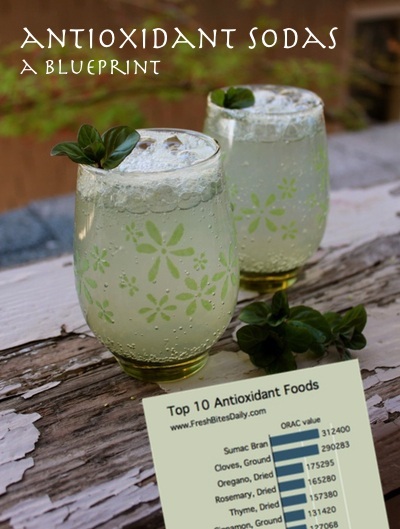 The idea isn’t really new — there are various botanical beverages on the market. My mom and a friend kicked around the idea of marketing such a beverage back in the 1980s. However, this strategy really is not widely used in home kitchens. It should be. It’s a lot of fun and it’s healthy. My mom had been gushing about one of her culinary oregano varieties and, specifically, how she had dried two gallons of it two years ago and it still tasted good. Two years for an herb is down-right geriatric and so I decided to try it myself thinking more than likely she was just being overly exuberant. I tried it as a tea and I was blown away. I turned it quickly into a soda and gave it to my boys. They gushed. We took it to my son’s coin class and passed it around to all of the students and teachers we could find at his small home school charter school. They gushed. 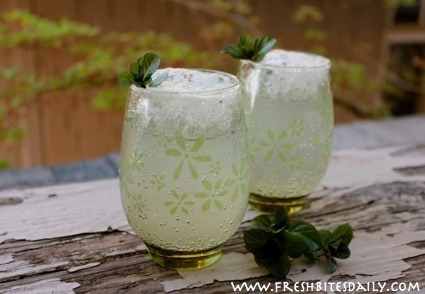 Everyone was suddenly gushing about a drink made with a green herb. 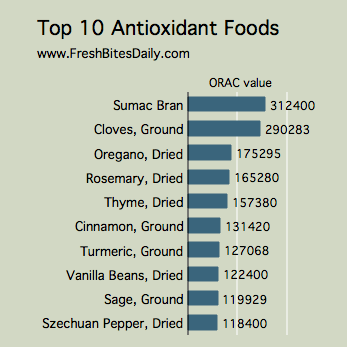 One evening as I lay in bed thinking about the gushing, this chart popped into my mind — the antioxidant content of herbs. Yes, indeed, this was the way to have soda and the herb world offers many flavor options. Here’s the basic idea: Make a really strong herbal tea and sweeten it to use as a syrup. Add it to carbonated water. You want the syrup to be strong in the herbal flavor because you will be diluting it quite a bit with your carbonated water. You will use a lot of herb this way. Ideally you’ll harvest them from your own garden in which case they will be nearly free. Honey is your healthier option but I do use white sugar when I want to taste the flavor of the herb directly and not influence it with the flavor of honey. Do what works for you. In a small saucepan, cover herbs with boiling water. Stir. Add sweetener, stir again, and cover with a tight-fitting lid. Allow the mixture to sit for a few hours or overnight, covered. After steeping for hours, strain the herb from the liquid, retaining the liquid. The liquid is your syrup. Add about one ounce of syrup to an 8-ounce glass and top with carbonated water. Taste and adjust your proportions. We have had great luck with rosemary, lavender, fir, oregano, lemon balm, lemon grass, lemon verbena, and various sages. There is the whole rest of the herb world to try.